Telemark skier Jasmin Taylor won silver on Tuesday. On Wednesday it was bronze. It's her fourth World Cup podium this month. The Telemark season only began earlier this month and Britain's Jasmin Taylor has picked up where she left off last winter. 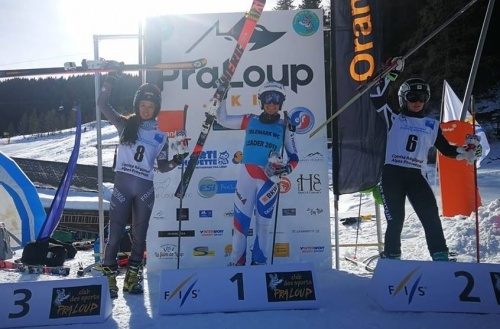 The 25-year-old stood on the podium for the third time this season on Tuesday, winning silver in the classic race at Pra Loup in the southern French Alps. That was the 25th World Cup podium of her career. On Wednesday, she took her tally to 26 - and four this season - with bronze in the sprint at the same venue. She is closing in on freestyle skier Jilly Curry's GB record of 29 World Cup podiums. In both the classic and the sprint races in Pra Loup, the winner was the overall leader of the World Cup this season, Amelie Reymond of Switzerland. In the classic, Taylor was runner-up to Reymond. Taylor's second place in the classic and third in the sprint follow her victory in the sprint at Pralognan-la-Vanoise last week. That was the fifth World Cup win of her career and the first time she had beaten telemark legend Amelie Reymond. Taylor was also second in the classic race at the opening World Cup event of the season in La Thuile, Italy. In addition to her four podiums so far this season, she's collected a couple of fourth places too. Taylor had a chance to make it three World Cup podiums in three days in Thursday's parallel sprint in Pra Loup. She couldn't quite manage it, crashing out in her quarter final to finish joint fifth. On Wednesday in the men's race, GB's Ben Emsley finished with his best World Cup sprint result in 20th position. On Thursday Emsley and GB's Louis Hatchwell were joint 17th in the parallel sprint. The next Telemark World Cup takes place in Germany on 9th and 10th February before the World and Junior World Championships in Slovenia on 14th to 18th February.